I suppose there are examples of colonists who preferred colonization to their former independence, but human history is filled with examples of the opposite. That is, the colonized attempting to overthrow the colonizers. Americans’ most important date is July 4, the date that commemorates their own Declaration of Independence. 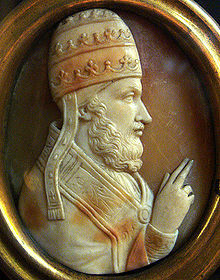 More than 750 years after the English-born Roman Patrick arrived in Ireland to convert them to Christianity, Pope Adrian issued a papal Bull known as the “Laudabiliter” in 1156. Think of an American president’s Executive Order, only more powerful. Over the next 800 years there were regular attempts by the colonized Irish to regain independence. These attempts sometimes partially succeeded, but were more often repulsed. By the mid-1920s, the Island of Ireland was in two parts: a Republic and Northern Ireland, a province of the United Kingdom. Despite the success of independence in the south, there were still many in Northern Ireland who continued to support a united Ireland. There is no exact or official date for the start of Na Trioblóidí, but by 1964 civil rights activists had been protesting against the discrimination against Catholics and Irish nationalists by the Ulster Protestant and unionist government of Northern Ireland. February 2, 1972: Prime Minister Edward Heath commissions the Lord Chief Justice, Lord Widgery to undertake a tribunal into the Jan 30 shootings in Derry. 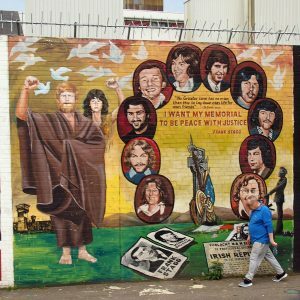 July 21, 1972, Bloody Friday: 22 bombs planted by the Provisional IRA explode in Belfast, Northern Ireland; nine people are killed and 130 seriously injured. January 4, 1976: the Ulster Volunteer Force kills six Irish Catholic civilians in County Armagh, Northern Ireland. The next day 10 Protestant civilians are murdered in retaliation. 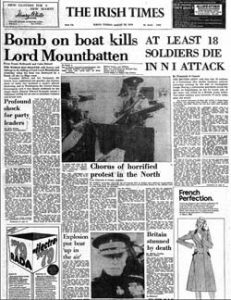 August 27, 1979: Lord Mountbatten of Burma and 3 others were assassinated by the Provisional Irish Republican Army. Mountbatten was a British admiral, statesman and an uncle of Prince Philip, Duke of Edinburgh. On the same day, the Warrenpoint ambush occurs: Provisional Irish Republican Army members attack a British convoy at Narrow Water, County Down, killing 18 British soldiers. November 23, 1979: in Dublin, Ireland, Provisional Irish Republican Army member Thomas McMahon was sentenced to life in prison for the assassination of Lord Mountbatten of Burma. March 1, 1981: Bobby Sands, a Provisional Irish Republican Army member, began a hunger strike for political status in Long Kesh prison. March 3, 1981: Humphrey Atkins, then Secretary of State for Northern Ireland, made a statement in the House of Commons in which he said that there would be no political status for prisoners regardless of the hunger strike. March 15, 1981: Francis Hughes, an Irish Republican Army (IRA) prisoner in the Maze Prison, joined Bobby Sands on hunger strike. March 22, 1981: Raymond McCreesh, an Irish Republican Army (IRA) prisoner in the Maze Prison, and Patsy O’Hara, then leader of Irish National Liberation Army (INLA) prisoners in the Maze, joined the hunger strike. 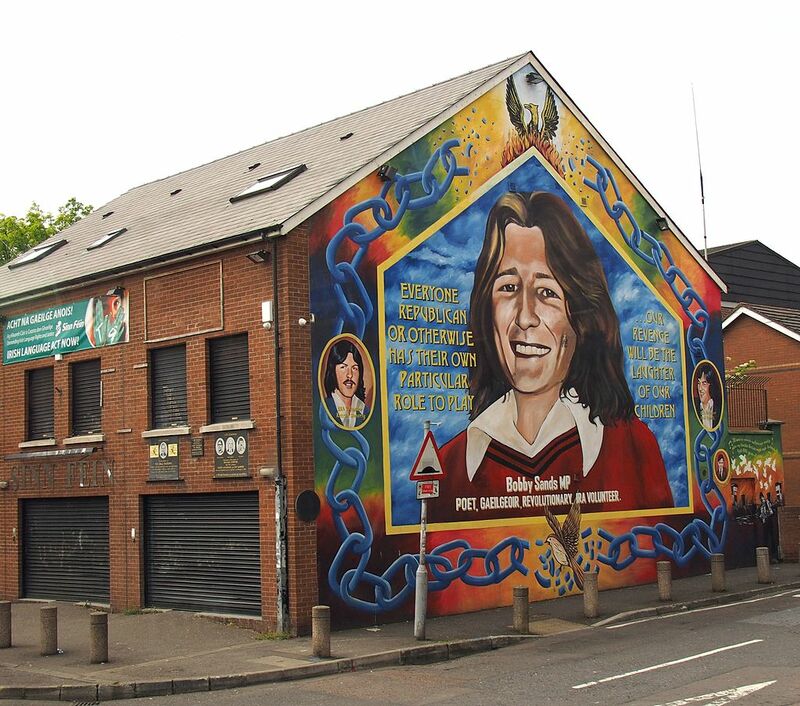 April 10, 1981:imprisoned IRA hunger striker Bobby Sands won election to the British Parliament. April 28, 1981: the private secretary of Pope John Paul II paid a visit to Bobby Sands in the Maze Prison but was unable to persuade him to end his hunger strike. Humphrey Atkins, then Secretary of State for Northern Ireland, stated that: “If Mr Sands persisted in his wish to commit suicide, that was his choice. The government would not force medical treatment upon him.” President Ronald Reagan said that America would not intervene in the situation in Northern Ireland but he was “deeply concerned” at events there. May 5, 1981: Bobby Sands, died aged 27. May 6, 1981: the day after Bobby Sands’ death, the British government sent 600 extra British troops into Northern Ireland. May 7, 1981: an estimated 100,000 people attended the funeral of Bobby Sands in Belfast. May 8, 1981: Joe McDonnell, then an Irish Republican Army prisoner in the Maze Prison, joined the hunger strike to take the place of Bobby Sands. May 12, 1981: after 59 days on hunger strike Francis Hughes (25), an Irish Republican Army prisoner in the Maze Prison, died. [Hughes’ death led to a further surge in rioting in Nationalist areas of Northern Ireland, particularly in Belfast and Derry. In Dublin a group of 2,000 people tried to break into the British Embassy. 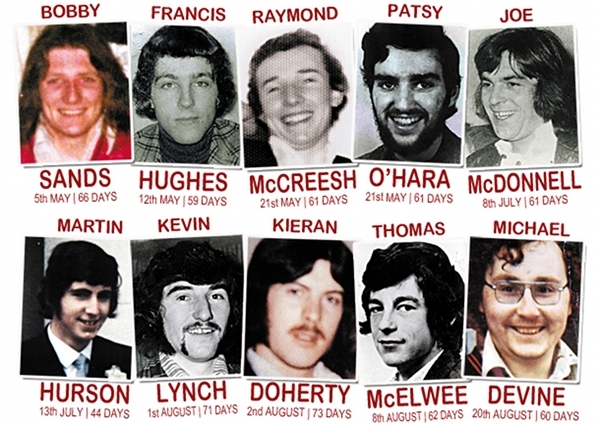 May 21 1981: Raymond McCreesh (24), a Irish Republican Army prisoner, and Patsy O’Hara (23), an Irish National Liberation Army (INLA) prisoner, both died having spent 61 days on hunger strike. May 22, 1981: Kieran Doherty, an Irish Republican Army prisoner in the Maze Prison, joined the hunger strike. May 29, 1981: the names of four prisoners on hunger strikes together with five other Republican prisoners, were put forward as candidates in the forthcoming general election in the Republic of Ireland. 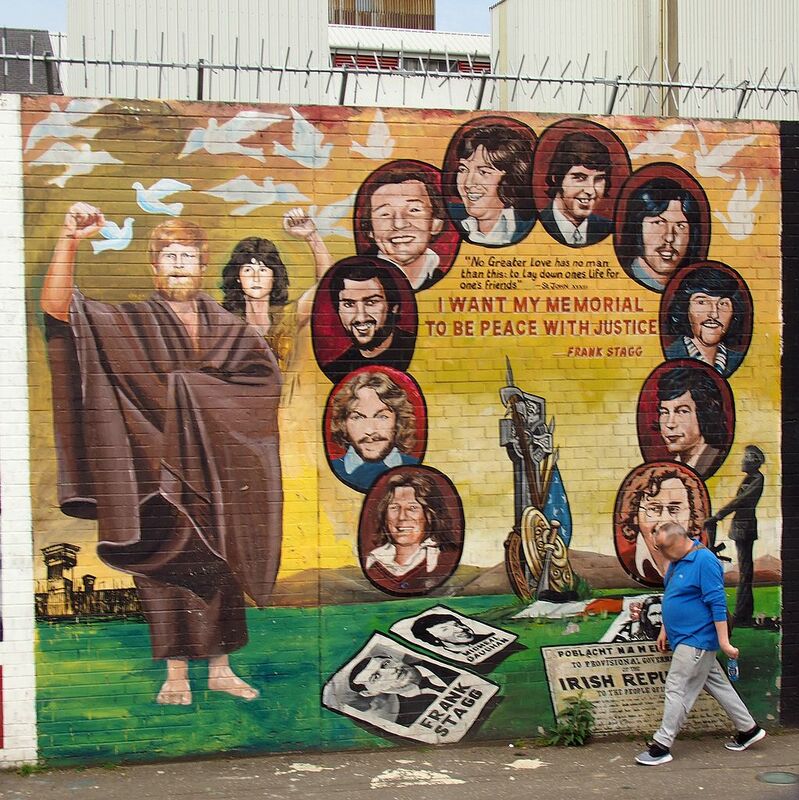 June 8, 1981: Tom McElwee, then an Irish Republican Army prisoner, joined the hunger strike. July 8, 1981: Irish Republican Joe McDonnell died at the Long Kesh Internment Camp after a 61-day hunger strike. July 10. 1981: funeral for Joe McDonnell. The British Army moved to arrest an IRA firing party at the funeral and seized a number of weapons and made several arrests. Rioting broke out following this incident. July 13, 1981: Martin Hurson (29) died after 46 days on hunger strike. August 1, 1981: The seventh hunger striker died. 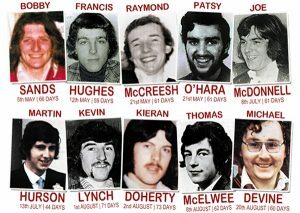 Kevin Lynch (25) died after 71 days on hunger strike. Lynch was a member of the Irish National Liberation Army (INLA).August 2, 1981: the eighth hunger striker died. Kieran Doherty (25) died after 73 days on hunger strike. 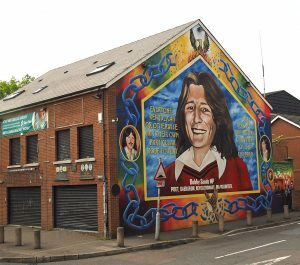 August 8, 1981: ninth hunger striker dies. Thomas McElwee (23) died after 62 days on hunger strike. This weekend marked the tenth Anniversary of the introduction of Internment and there were widespread riots in Republican areas. Three people were killed during disturbances over the weekend. August 9, 1981: Liam Canning (19), a Catholic civilian, was shot dead by the Ulster Freedom Fighters (UFF), a covername used by the Ulster Defence Association (UDA), as he walked along Alliance Avenue, Ardoyne, Belfast. Peter Maguinness (41), a Catholic civilian, was shot dead by a plastic bullet fired by the Royal Ulster Constabulary (RUC) while he was outside his home on the Shore Road, Greencastle, Belfast. There were continuing riots in Nationalist areas of Northern Ireland. August 20, 1981: tenth hunger striker dies. Michael Devine (27) died after 60 days on hunger strike. October 3, 1981: those Republican prisoners who had still been refusing food decided to end their hunger strike. At this stage in the protest six prisoners were on hunger strike. The prisoners took their decision when it became clear that each of their families would ask for medical intervention to save their lives. October 6, 1981: Secretary of State for Northern Ireland, James Prior, announced a number of changes in prison policy, one of which would allowed prisoners to wear their civilian clothes at all times. This was one of the five key demands that had been made at the start of the hunger strike. Prior also announced other changes: free association would be allowed in neighboring wings of each H-Block, in the exercise areas and in recreation rooms; an increase in the number of visits each prisoner would be entitled to. July 20, 1982: the Provisional IRA detonated 2 bombs in central London, killing 8 soldiers, wounding 47 people. September 25, 1983: Maze Prison escape: 38 Irish republican prisoners, armed with six handguns, hijack a prison meals lorry and smash their way out of HMP Maze, in the largest prison escape since World War II and in British history. December 17, 1983: a Provisional IRA car bomb killed 6 Christmas shoppers and injured 90 outside Harrods in London. October 12, 1984: The Provisional Irish Republican Army attempts to assassinate Prime Minister Margaret Thatcher and the British Cabinet in the Brighton hotel bombing. February 28, 1985: the Provisional Irish Republican Army carried out a mortar attack on the Royal Ulster Constabulary police station at Newry, killing 9 officers in the highest loss of life for the RUC on a single day. November 15, 1985: Britain and Ireland signed an accord giving Dublin an official consultative role in governing Northern Ireland. November 8, 1987: a bomb planted by the Irish Republican Army exploded as crowds gathered in Enniskillen, Northern Ireland, for a ceremony honoring Britain’s war dead, killing 11 people. March 16, 1988: Milltown Cemetery attack: during a funeral for three Provisional IRA volunteers, Ulster Defence Association (UDA) volunteer Michael Stone attacked the crowd with grenades and pistols, killing three and wounding over sixty. 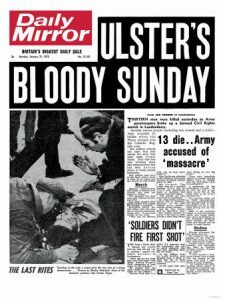 March 19, 1988: two British Army Corporals were killed after driving straight into a funeral for the victims of the Milltown Cemetery attack three days earlier, after they were mistakenly thought to be carrying out a similar attack to the one by Ulster Defence Association (UDA) member Michael Stone, in which he killed three Catholics attending the funeral. September 22, 1989: Deal barracks bombing: An IRA bomb explodes at the Royal Marine School of Music in Deal, Kent, United Kingdom, leaving 11 dead and 22 injured. April 10, 1992: a Provisional Irish Republican Army bomb exploded in the Baltic Exchange in the City of London; 3 are killed, 91 injured. December 15, 1993: the Downing Street Declaration, issued jointly by UK and the Republic of Ireland, affirms the UK would transfer Northern Ireland to the Republic of Ireland only if a majority of Northern Ireland’s people approved. “Zombie” is a protest song by written about the 1993 IRA bombing in Warrington, and in memory of two young victims, Johnathan Ball and Tim Parry. February 18, 1996: an IRA briefcase bomb in a bus kills the bomber and injures 9 in the West End of London. July 19, 1997: the Provisional IRA re-instated the ceasefire. September 9, 1997: Sinn Fein, the Irish Republican Army’s political ally, formally renounced violence as it took its place in talks on Northern Ireland’s future. In November 1997, IRA dissidents held a meeting in a farmhouse in Oldcastle, County Meath, and a new organisation, styling itself Óglaigh na hÉireann, was formed. It eventually became known as the Real IRA. December 11, 1997: Sinn Fein leader Gerry Adams became the first political ally of the IRA to meet a British leader in 76 years. He conferred with Prime Minister Tony Blair in London. 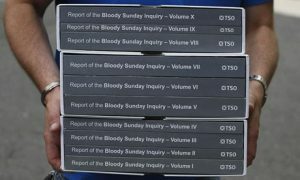 In January 1998: after 15 years and many media reports suggesting the original tribunal’s inquiry was flawed, a second commission of inquiry, chaired by Lord Saville, was established to re-examine ‘Bloody Sunday’. April 10, 1998: the Belfast Agreement signed between the Irish and British governments and most Northern Ireland political parties. 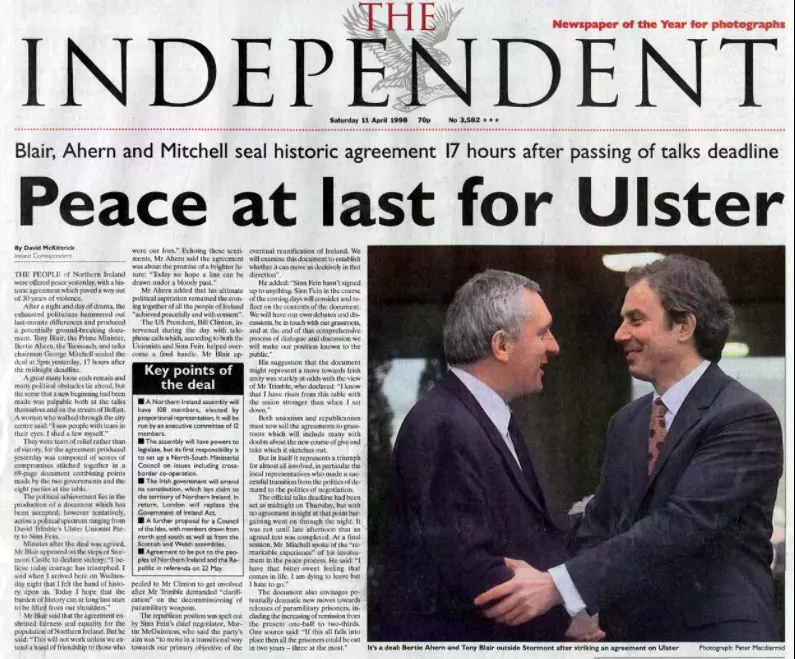 May 22, 1998:voters in Northern Ireland and the Republic of Ireland cast ballots giving resounding approval to a Northern Ireland peace accord. 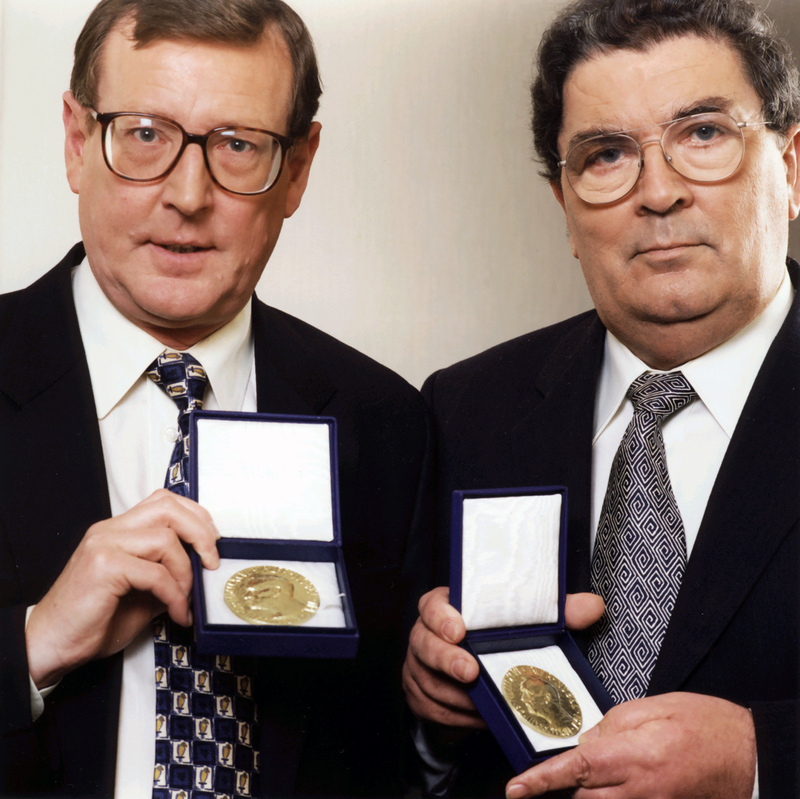 October 16, 1998: David Trimble and John Hume were named recipients of the Nobel Peace Prize for brokering the Northern Ireland peace accord. November 29, 1999: Protestant and Catholic adversaries formed a Northern Ireland government. December 2, 1999:a power-sharing cabinet of Protestants and Catholics sat down together for the first time in Northern Ireland. July 28, 2005: the Provisional IRA issued a statement formally ordering an end to the armed campaign it has pursued since 1969 and ordering all its units to dump their arms. A series of riots between 20 June 2011 and 16 July 2011, starting originally in Belfast, before spreading to other parts of Northern Ireland. They were initiated by the Ulster Volunteer Force. 1 November 2012 prison Officer, David Black, was shot dead on the M1 motorway near Craigavon while driving to work. The shots were fired from another car, which drove alongside. The Real IRA claimed responsibility. March 4, 2016, prison officer Adrian Ismay died from a heart attack in a hospital. He had been seriously wounded by a booby-trap bomb which detonated under his van on Hillsborough Drive, East Belfast 11 days earlier. These wounds were directly responsible for the heart attack that killed him. The “New IRA” claimed responsibility and said it was a response to the alleged mistreatment of republican prisoners at Maghaberry Prison. It added that the officer was targeted because he trained prison officers at Maghaberry. 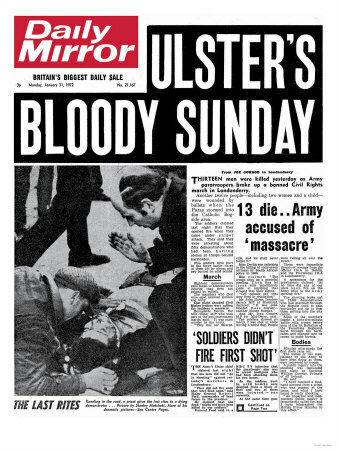 March 14, 2019: the North’s Public Prosecution Service (PPS) announced in Derry that one former British soldier—simply identified as Soldier Fs—would be charged over the Bloody Sunday killings. Soldier F would be prosecuted for the murder of James Wray and William McKinney and for the attempted murders of Joseph Friel, Michael Quinn, Joe Mahon and Patrick O’Donnell. No other former British soldier faced prosecution. The PPS said that “in respect of the other 18 suspects, including 16 former soldiers and two alleged Official IRA members, it has been concluded that the available evidence is insufficient to provide a reasonable prospect of conviction”. 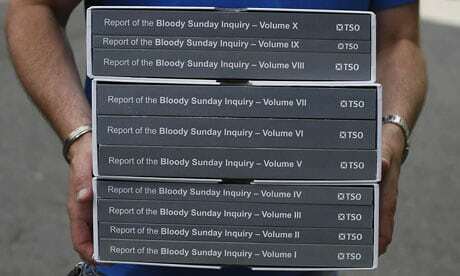 The decisions related only to allegations of criminal conduct on Bloody Sunday itself, the PPS said in its statement. “Consideration will now be given to allegations of perjury in respect of those suspects reported by police,” added the PPS. 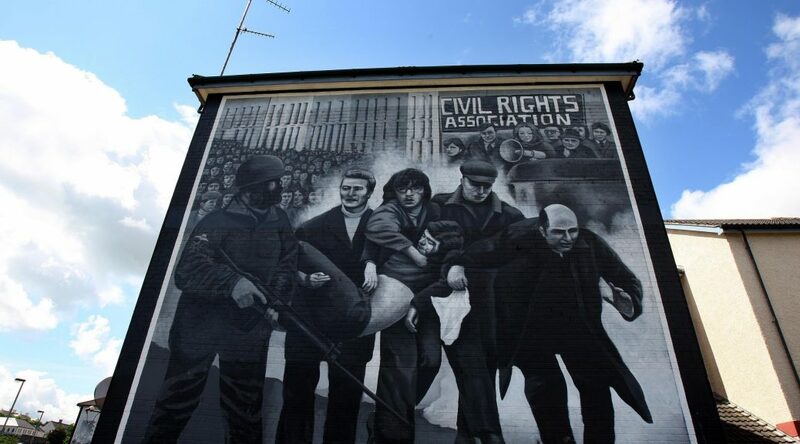 April 23, 2019: the New IRA admitted responsibility for the death of journalist Lyra McKee in Derry. McKee (29) died as a result of injuries sustained when she was shot on the Creggan estate on April 18th. The Police Service of Northern Ireland said it had arrested a 57-year-old woman over the killing. Three people were also arrested in connection with McKee’s death. Two individuals who had been detained were released without charge. In a statement given to The Irish News using a recognized code word, the group offered “full and sincere apologies” to her family and friends. The New IRA is an amalgam of armed groups opposed to the peace process and it recently claimed responsibility for parcel bombs sent to London and Glasgow in March.